Will Durham Get Serious About Biking? Durham, North Carolina, seems like a city that should be making progress on bicycling. Last year, the City Council adopted a Vision Zero policy. And this year, Bloomberg Philanthropies awarded Mayor Steve Schewel’s administration a grant to help reduce car commuting downtown. But city officials have been slow to translate these ideas into tangible changes. The redesign of Broad Street typifies the city’s inertia. Broad Street is a commercial corridor connecting different neighborhoods, and local bike advocates see it as a great candidate for a protected bike lane. When the street was due for a resurfacing this year, city officials put out three options, including two that include some degree of physical protection for cyclists. Hundreds of public comments were submitted, and more than 70 percent supported a protected bike lane, according to Council Member Charlie Reece. But City Manager Tom Bonfield announced last month that the city had selected the only option of three scenarios without any physical protection. Bonfield told the Herald Sun that the city decided against protection because the street has too many driveways and curb cuts. The city listed a number of other minor concerns in a memo. In a rebuttal, the advocacy group Bike Durham pointed out that city officials are mainly worried about trying out treatments that feel new to Durham but have proven to work. Bonfield doesn’t like the idea of a parking-protected bike lane, for example, because people will be getting in and out of cars next to an 11-foot travel lane. Bike Durham notes that drivers already do that on Main Street. One local bike commuter compiled this video of “close calls” on Broad Street. An unprotected bike lane simply won’t change the street enough to make biking feel safe to most people. “With the current design, every time someone parallel parks or double parks on Broad, a cyclist will be pushed into 35 mph traffic or faster,” Bike Durham wrote in an appeal to its members. About 300 people wrote to the City Council asking them to support the protected bike lane design. The volunteers serving on the Durham Bicycle and Pedestrian Advocacy Commission also called on Bonfield to reconsider. “We feel that the design does not live up to the standards laid out in Vision Zero,” the group wrote in a letter last month. Some council members, like Reece, support the protected bike lane design. Bike Durham wants to see the City Council push for that option when it returns from recess mid-month. But because the Broad Street project is funded by North Carolina DOT, Bonfield and the city don’t need the council’s permission to continue. “If the City is committed to the goals it has set for itself, then its leaders will need to push through the fear of novelty and imperfect conditions to get the ‘interested, but concerned’ citizen out of their car and onto a bike,” Bike Durham’s Landis Masnor told Streetsblog. This is a common public policy issue across cities. An innovative plan or design supported by the public only to be watered down during implementation. With that said, the design chosen is a big improvement over the existing cross section. My only issue is the door zone bike lane. 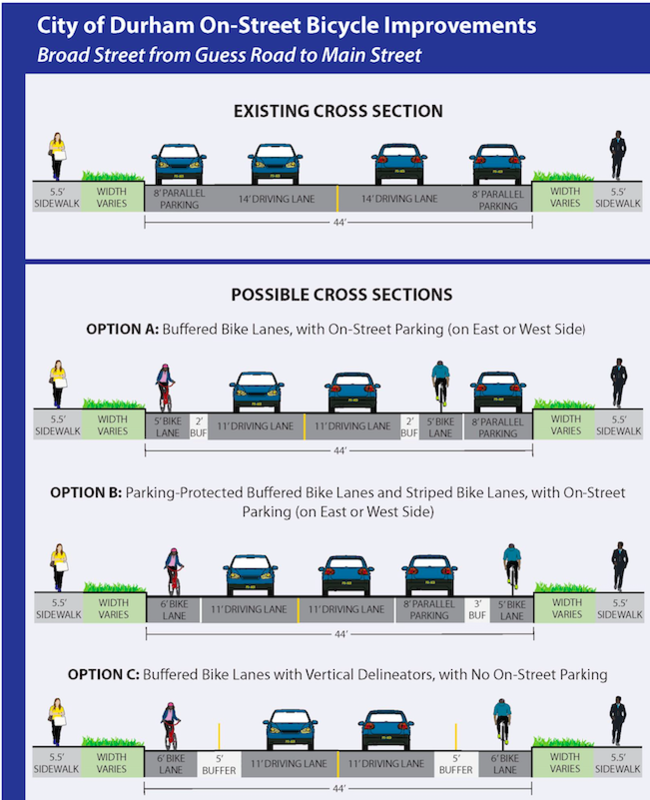 I would take the traffic lanes down to 10′ and allocate that ROW to a buffer between the bike lane and the parking lane. Two years into Kenney's tenure, it already seems unlikely that he'll achieve his promise to improve the bike network.